Making a Japanese Zen garden in your yard is not as difficult as you might think. Keeping in mind a few basic principles of design and picking the right plants will allow you to have a peaceful spot for meditation or just looking at the beautiful scenery. Borrowed landscape: Japanese gardens often use the landscape surrounding the garden as a feature of the garden itself. For example, a mountain in the distance might be framed by an archway in the garden. Water: Water is a very important aspect of Japanese garden design. You'll usually see ponds, streams or waterfalls in traditional Japanese gardens. Waterfalls in particular are a popular feature, but the look of a waterfall without water can be created with rocks. Bridges: When using all that water, especially if there's an island in the pond (another popular feature of Zen gardens), you're going to need a bridge. Slabs of stone can be used for this. A Chinese arched "full moon bridge" is also commonly used. Stone lanterns: Often placed beside a path or near a water feature, stone lanterns are a very common addition to Japanese garden design. Stones: Strategically placed rocks and stones are used as design features in the garden. Stones are often positioned so they are jutting out of the water or in a raked sand garden. Sand: The raked sand garden is probably what most people think of when they think of a Japanese Zen garden. These structures are popular in Shinto shrines, where they are said to make a place more hospitable for spirits. Depending on how the sand is raked, it can look like flowing water or simple straight lines. Paths: A typical Japanese garden is designed for strolling. The paths are meandering, but that does not mean they are haphazard. Paths are seldom straight and often curve around other features in the garden and direct the visitor to take time and view the surroundings with care. Plants: The final element of the Japanese garden is the trees, shrubs and flowers, which are discussed in greater detail below. If you are starting from a completely new landscape with no established plants, you can easily choose plants that have meaning and are traditional to a Japanese garden. Otherwise you can work with what you have and add in elements of the Japanese style to bring more authenticity to your space. Most people think of the Japanese maple when they think of Japanese gardens. While these trees are both popular and lovely, they are not the only choice. Gnarled old pine trees are appreciated in both Chinese and Japanese cultures as a representation of long life. Other evergreen trees can be used as well. Often they are pruned or shaped to give an old and gnarled appearance. The flowering plum is another popular choice because it blooms in winter when little else is looking good. Shade-loving shrubs are perfect for the Zen garden because they can live happily under the taller trees. 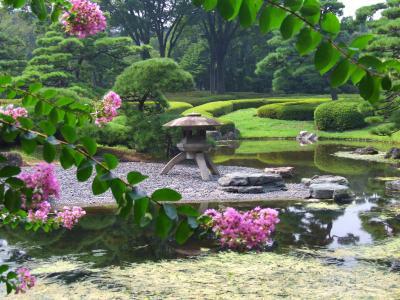 Azaleas, rhododendrons, hydrangeas and wisteria are all popular choices for Japanese gardens. Bamboo, which is actually a grass but spreads so that it looks almost like a shrub wall, is another popular choice. It can be used for ornamentation as well as for cutting off views to other parts of the garden, which you can then only see by wandering farther down the trail. Traditional Japanese gardens relied a lot on reeds and grasses, as well as flowering plants, trees and vines. Water-loving flowers such as the iris, lotus and water lily are popular choices. Choose flowers that you like and that will blend well with the other plants in your garden. It's a good idea to go with plants that are native to your area, even if they don't look like a traditional Japanese Zen garden. They will be more successful than exotic plants that may not be able stand your winters or summers. If you are ready to create your own backyard retreat, see How to Make a Zen Garden for detailed DIY instructions that can be followed exactly or customized for your needs. Given all of the elements that are typically included in a Japanese garden, you may be tempted to cram everything into your space, even if it's very small. That is not a good idea. Japanese gardens tend to have empty space; they're not crammed to overflowing with plants and rocks and other features. If you have to let some elements go to make the garden work in your space, so be it. Even a wonderful stone lantern surrounded by azalea plantings would make a fine corner Japanese garden if that is all you have room for.